The FlowSight® Imaging flowcytometer offers high performance in a small package. Identifying cell conjugates or distinguishing single cells from doublets and debris has never been so effortless. The FlowSight® Imaging Flow Cytometer stands apart from other conventional flow cytometers by producing up to 12 images of each and every cell. The unique image collection system simultaneously produces darkfield (side scatter), brightfield, and up to 10 fluorescence images. The FlowSight® Imaging Flow Cytometer operates at ~20X magnification allowing visualization of fluorescence from the membrane, cytoplasm, or nucleus. Numerous thoughtful design details like a dedicated side scatter laser, adjustable laser intensities, and brightfield imagery for the direct measurement of cell size allow the FlowSight® to resolve cell populations more effectively than far more expensive cytometers. The ease of use, outstanding performance, and imagery of each cell allow the FlowSight® to meet the needs of beginners and experts alike. A proprietary CCD camera, coupled with patented detection technology, yields fluorescence sensitivity that is at least ten times that of PMT-based flow cytometers across all channels. 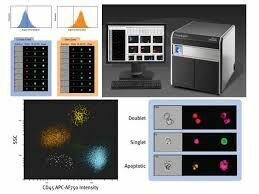 The Amnis imaging cytometer is supported by post-acquisition image processing software allowing highly quantitative determinations of the location and strength of fluorescence signals for morphological applications such as nuclear translocation and shape change. IDEAS® Software combines image analysis, statistical rigor, and visual confirmation in an easy-to-use package. Flow cytometry has never been so intuitive. With the imaging capabilities of the FlowSight®, you’ll never wonder about outliers or whether your gates are in the right place. With visual feedback, you can optimize gate size, shape, and position for better data quality.